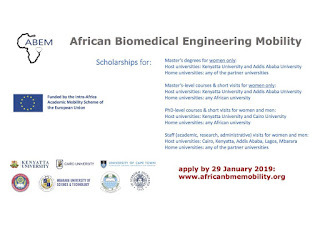 African Biomedical Engineering Mobility (ABEM) Scholarships for African Postgraduate Students & Staff Ongoing, See Eligibility, Benefits, Mobilities, Application Guidelines for 2019/2020. The ABEM individual scholarships cover one roundtrip flight ticket, visa costs, participation costs (which may include tuition fees, registration fees and service fees), comprehensive insurance coverage (health, accident and travel) and a monthly subsistence allowance from which scholarship recipients are to cover accommodation expenses. The monthly subsistence allowance is calculated per mobility option (and can be viewed under ‘Scholarship Information and guidelines’). Target Group 1 refers to students registered at or staff employed by one of the ABEM partners. i.e. Kenyatta University (Kenya), Addis Ababa University (Ethiopia), Cairo University (Egypt), Mbarara University of Science and Technology (Uganda), the University of Cape Town (South Africa) and the University of Lagos (Nigeria). Target Group 2 refers to students registered in or having obtained a degree from a higher education institution not included in the partnership but established in an eligible country (see below). 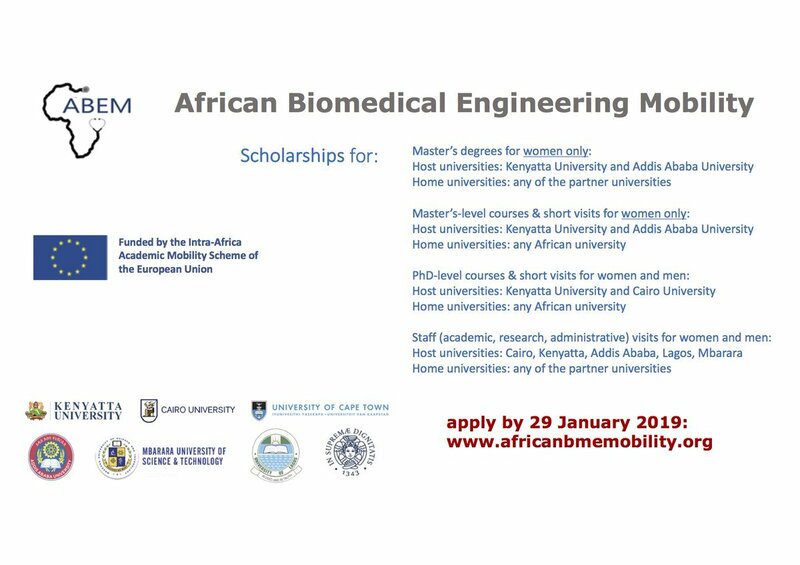 Apply Before: 29th January, 2019.